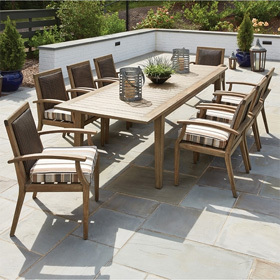 Relax in comfort and style with the Lloyd Flanders Cayman patio set with 4 swivel rocker lounge chairs and the premium teak chat table. The Cayman collection is from Lloyd Flanders woven vinyl series of furniture and features a Caribbean inspired light brown Hyacinth twisted wicker weave pattern. We offer your choice of outdoor fabrics for the lounge chair cushions and free delivery. Chairs 39"W x 37.75"D x 32.75"H 60 lbs. Table 48"L x 48"W x 19"H 51 lbs.